When I did a search of this blog for “fare evasion” I found 44 blog posts. I have not tried to read any of them but I do know that one theme I went back to more than once was that the faregates would not eliminate fare evasion, they would just change the way that it was done. CTV now have a report on how the single ride ticket can be reprogrammed with a cell phone to allow more than one ride. They do not tell you how to reproduce this hack for yourself, but apparently it has been known for some time and has demonstrated on other Cubic systems such as New York. And apparently it is possible for Translink and the Transit Police to determine if a ticket has been hacked. Get caught with one and you face a charge of fraud rather than fare evasion. I did not know about this hack when I was writing those posts, and I am not promoting its use now. What I did know was that every fare collection system has been a target of hackers: no transit system gets 100% compliance and the case Kevin Falcon tried to make was fatally flawed from the start. The only surprising thing about this story is that the ability to hack tickets had not been identified publicly earlier. Translink’s representative says they knew about it last year. Cubic could not be reached for comment – I suspect because they probably knew much earlier and kept quiet. Postscript: once this blog post appeared on line, Jon Woodward, the CTV reporter who produced the original story, did read my older blog posts and tweeted about one I wrote in 2008 about London’s Oyster card being hacked. Which, of course, was exactly the same position that Translink adopted when they originally examined faregates before Kevin Falcon imposed them ignoring the cost-benefit analysis. We are leaving here tomorrow. It is a shame to have to say this, but I am actually glad to be going home. Our landlady in Florence told us that there was no point in staying for two weeks, there was not enough to keep us here. We have been in Venice last weekend largely as a result of this advice. We fell in love with Venice, and would have liked to have been able to stay longer. The expense alone was enough to deter that thought. If we could have got back to Vancouver from there … well anyway. Let me tell you about today, which is all about the sort of issues that get discussed on this blog all the time. Last weekend, on Saturday, before our departure for Venice next morning, we took the advice of our Lonely Planet guide and decided to “get out of town”. Fiesole is a beautiful Tuscan hill village with stunning views and amazing archaeology. You can get there on a #7 bus, from Piazza San Marco within the 90 minute validity of a single ride. So tram ride ride from the apartment, walk across the Centro Storico, and up the hill we go, with a bus full of American art students. When we get to the village square – where the #7 turns round and goes back down the hill – there is a sign on the bus stop. Something obviously rushed out at the last minute on the office printer. No service on the #7 after 15:00 because of a road race – the 100km super marathon – a big deal – through Fiesole which means road closures and who knows when regular bus service can be restored. We saw the view – stunning – had lunch – ordinary but twice the price because of the view – and then caught the next bus back to town in case we got stuck and missed our train to Venice in the morning. Today we tried again. 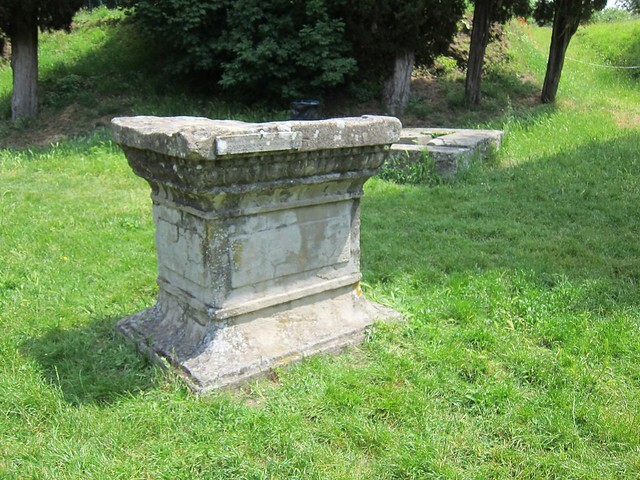 Fiesole deserved a second chance, if only for its archaeology. Not just Etruscans and Romans but Lombards too. The bus stop for the #7 was beseiged. Local buses could not get near because of a flood of tour buses. In Livorno a massive cruise ship had landed, and tipped off its human cargo onto fleets of coaches full of punters sold on the idea of seeing Michaelangelo’s “David” for real. They get to see Florence in the morning and Pisa in the afternoon (or vice versa). The #7 bus stand is close to the Academy where this version (the real, authentic, actual statue as seen on tea towels and t shirts) could be seen. If you are waiting for a #7 local bus and many tour buses occupy the space where your expected municipal service is going to be, you get anxious. What if the local bus drives straight past, unable to pick you up because of this huge, throbbing airconditioned landwhale is unloading its cargo of bemused, earphoned tourgroupistes onto the one person wide sidewalk? It was chaos I tell you. Eventually things sorted themselves out and the #7 arrived and we boarded within our permitted 90 minutes. It was a struggle for the bus from there but we just sat and observed how the usual dramas of urban life unfold. An MVA involving another bus, a BMW and a motorscooter, closing three of four lanes. A delivery van, double parked, while urgent packages are rejected for damage incurred while dealing with … a sudden intervention by several varieties of cops (carabineri, local plods, security company wannabes) misdirecting – an ambulance with the horrible wailing siren, unique to their kind, makes all thought impossible. Daily life in Florence. We got there. Roman ruins were seen. 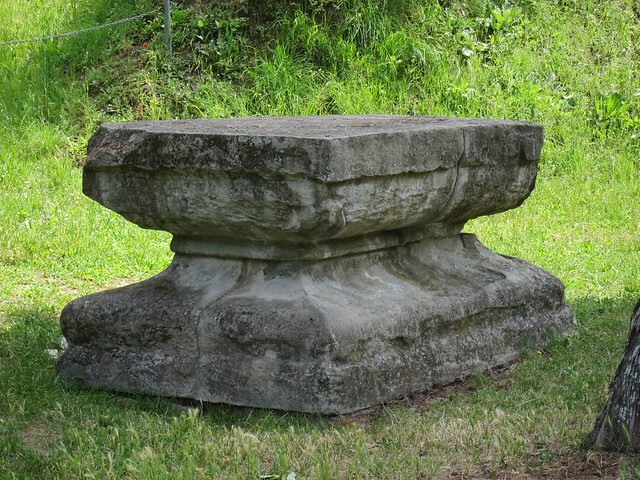 The difference to Etruscan ruins was noted. Lombard burials were studied in minute detail. The play of mottled sunlight on Tuscan hillsides was dutifully recorded. Lunch was eaten, beer was drunk, Fiesole was given its due. Time to return. The #7 is waiting in the square but somehow some other distraction means that it has – how sad – circled the roundabout and gone back down the hill, without us. We find a bench in the shade, where we can wait the quarter hour that must elapse before another #7 will appear. And as we sit observing the human life around us, we note the numbers of others who place themselves between us and the bus stop. There is no orderly queue. The bus has three doors, and all are fair game for entry. And the capture of the very few seats – let alone those that face forward and allow a view out of a window – requires strategy and cunning. When the bus does arrive, two schoolgirls nip aboard and occupy the seats designated for those over 65 – to which I am entitled and feel that I have earned, being at the bus stop a full 15 minutes before they appeared. My partner deals with the smart cards (proximity reader not being proximate to the desired seats). They get the window seats and pretend not to understand my protests. But all is well and we are seated, if not optimally at least satisfactorily, and eventually the girls get off and we can arrange ourselves … wait, what, some scruffy individual, wants to inspect my ticket?? No uniform, no apparent authority? It seems when the “smart card” was waved in front of the reader, no new ride authority was actually established. My partner’s card is fine, mine despite its three ride validity remaining is deemed “expired”. FIFTY EUROS cash to expunge the offence, once the details of the UK passport I carry with me to get free entry into National Monuments (but not, be it noted Fiesole Museums or archaeological sites) are copied onto a three part, no carbon required, form. He even digs into his clothing and produces photo ID which shows that he is actually the Yoda of ATAF – so there is no point in arguing – and a new crisp €50 note saved for “a rainy day” is handed over. The alternative is not worth contemplating. The shame, the publicity, the headlines. Far better to sign on the dotted line on a form – being Italian – that I have no hope of understanding. Your card reader, ATAF, failed but I must pay the price, or face ignominy. I note, from a distance, that once again the Compass card is under assault. That Cubic is once more fair game in the fare evasion/faregates/fare or foul fraud foofooraw. Meh! Life goes on. I will be back next week, refreshed. Able to sleep all night and function on Pacific Summer Time. This too will pass. What: Wai Young, Member of Parliament for Vancouver South, together with the Honourable Blair Lekstrom, Minister of Transportation and Infrastructure and Member of the Legislative Assembly for Peace River South, and Doug Kelsey, chief operating officer TransLink, will be attending an event to mark the installation of the first faregate at TransLink facilities around Metro Vancouver. Please note: The faregate will be installed but it won’t be operational until 2013, when all the faregates are installed and ready. It’s the beginning of the end for transit cheats as first faregate is installed Monday at Marine Drive #SkyTrain station on #CanadaLine! So of course I and others had to correct him. Faregates will not end fare evasion – they will just change the way its done. 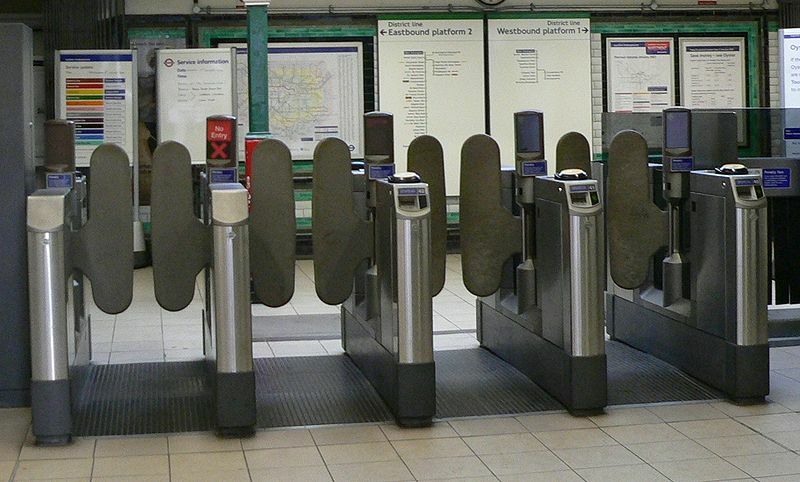 Every system – with or without gates – has fare evaders. The systems that have always had gates since day one also have dedicated teams trying to reduce fare evasion. I have watched their operations in London, Paris, New York – and indeed some of those systems are quite open about the cost benefit ratio of their operations against evaders. Unlike BC. First of all isn’t it a bit strange for the provincial and the federal politicians to be front and centre at an event like this? If transit were adequately funded in the the first place perhaps quite so much attention would not be focussed on the relatively small sums involved. And one thing that you can be sure of is that no-one is going to be talking about how much this system is going to cost to operate. Already we know that its capital cost cannot be recovered simply from everyone paying the correct fare – even if the system could actually deliver on that (it can’t, of course). But that also ignores how much it is going to cost to shift operational personnel from their current duties to looking after the fare gates and ensuring that people who cannot get through them – legitimately – can be reasonably accommodated. We need a lot of money invested in transit in this region – even if we are going to stand still at current mode share let alone the once much touted but now essentially forgotten imperative to increase it. Faregates do nothing to get more people onto transit. The assertion that they will make the system safer is simply baseless. There is, unfortunately, as much or more crime on gated systems. Just because there are crowds of people and some criminals see that as a more efficient way to channel their own efforts. Effective policing will continue to be important: just because the gates will check the tickets does not mean that security can be lowered. If they do improve the perception of safety that will quickly change with the first high publicity incidents. I see no reason to be manipulated by the PR system. This is simply two unpopular governments trying to get themselves in front of the cameras doing something that will be, briefly, popular. Unfortunately, what the majority want, in this case, is not going to be delivered. I wonder what the next magic bullet will look like. This morning I came across a news story on how Transport for London is to increase its penalty fares. The journal I was reading (Railway Herald) publishes as a locked pdf – which means it cannot be quoted by cut and paste, but I quickly found out that all they had done was copy a TFL Press Release including its headline – so I think I will do the same but at least I have acknowledged where it came from. Penalty charges have risen to £80 on all parts of the capital’s transport network as Transport for London (TfL) continues its battle against fare evasion. The increase – from £50 to £80 – covers London Underground, London Overground, buses, Docklands Light Railway and tram services. Passengers who fail to pay for their tickets will receive a penalty charge which, if left unpaid, could lead to a criminal record and a fine of up to £1,000. Those who pay within 21 days will see their fine reduced to £40. Despite a fall in the rate of fare evasion in recent years, the cost to TfL last year was an estimated £63m. In addition to the penalty deterrent, TfL also employs more than 500 revenue protection inspectors on its network to combat fare dodgers. As I am sure you all know, London’s Underground has been gated for many years now with gates not too dissimilar to the ones now going in on our SkyTrain stations. The point of this post is simply to re-iterate that the “investment” now being made on our system will not eliminate fare evasion. If we do as well as London – and that would mean we would need penalty fares, the revenue of which comes back to the system, not the coffers of the government, and continued on train and bus fare inspections – we might halve the current evasion rate. I suspect that this actually requires a considerable increase in enforcement resources, which makes the return on capital even worse than anticipated. The way things are going for the BC Liberals at present, I doubt that they will still be in government by the time this turkey comes home to roost. And anyway it will be Translink that gets the blame I expect – though it ought to be directed at Kevin Falcon. Yesterday I was interviewed by the Montreal Gazette. Apparently Montreal is seriously considering using the Translink model to reform its current governance of transit. I told the reporter that I thought they ought to look at a metropolitan region that has actually been reasonably successful at providing a good transportation system. London or Paris seem to me to be far better at it than Vancouver. And we weren’t talking about fare dodgers. But at least we seem a bit better than Toronto right now. Two stories in today’s Sun struck me as being “bloggable” in the sense that they clearly meet the criteria of its stated purpose. The issue for me has been what to say about them that is worth saying – given that they are really not new or different, and only require me to repeat things that I have written here before, many many times. Both illustrate what happens when we deal with transportation as though it were an end in itself. Both result from “silo” thinking. They are caused by the way we govern ourselves and the institutional arrangements we have. How people get to become decision makers – and what those decisions do to us. The first is Ken Hardie threatening to cancel U-Pass. An empty threat, of course. Ken himself can’t do that: indeed, it would be very difficult for Translink to do that, though they might indeed find themselves in that position. Fare evasion would not be the only reason, but could be cited as a contributory factor. Ken says that the selling of UPasses on Craig’s list is threatening the viability of the program. Now you do understand, don’t you, that Ken is the spokesperson – the chosen communicator. Indeed, that is where his expertise lies. Not in transportation or economics, but in presenting organizations to the public in the best possible light. The sort of person who suscribes to the idea that perception is reality. Though in fairness I have to say that is was his former boss Bob Paddon who tried to persuade me of that, not Ken himself. And the rising losses, he warned, could put the program in jeopardy because if it’s not sustainable, TransLink will consider shutting it down. Ah, so now we are in the murky area where we do not have direct reported speech – and that is what the headline writer (not Kelly Sinoski) mangled. UPass never was “sustainable” – and could not have been from the outset. For a long time, the staff who examined the idea of the UPass told the senior management – “The Executive” – that Vancouver was not like King County, which had introduced UPass for Washington state university. Metro there had spare capacity it could utilize. BC Transit in Victoria found something similar. In this region UBC is out at the end of a peninsula and SFU is on the top of a mountain. And neither university has nearly enough student accommodation on campus, and no way to fund more. The pressure on the transit provider was to help solve the universities’ problems – and those of the students forced to commute great distances by the lack of affordable accommodation. As a policy analyst I pointed out that students were no different to large numbers of other people who were also commuting due to the Vancouver housing affordability issue, and I could not make a plausible case for their needs to be given priority over other, arguably more deserving groups – the working poor for instance, or single mothers trying to get off welfare , or people with disabilities. It may have been significant that when the UPass was finally approved Translink’s CEO had a daughter who was going to UBC. It may also have been significant that the planner who presented the case used the “revenue neutral” formula. He said that the deal would not reduce the amount of money coming in to the system. He said nothing about cost – the money going out of the system – or capacity – the ability of the system to adapt to changing demand patterns. “Sustainability” was not an idea mentioned in the context of Upass. I know that since it was such a hot button word for me. The communicators had gotten ahold of it. Indeed some time before I was trying to convince provincial government environment ministry communicators not to talk about “sustainable transportation” since it was not a meaningful concept. Sure it would help the environment if fewer students drove and more used transit – but since many students car pooled that was not exactly clear cut. And anyway, no one was willing to pick up the tab. It seemed to me that any decision had to be based on a cost benefit analysis in policy terms and a cost effectiveness analysis for operational reasons. UPass was not subject to either of those tests. “Revenue neutral” was a catch phrase, usable in sound bites. Not good policy but easy communicability. If we were really interested in sustainability we would question the location decisions that give rise to so much motorised transportation demand. And we would also wonder about setting up higher education establishments that think only of research and teaching but not accommodation. At one time the most important person in any college was the bursar – not the vice-chancellor. Once universities were made more business like – and made to get their funding from corporations – they lost the ability both to govern themselves sensibly and to meet the needs of society as a whole. UPass has been very successful in getting transit ridership increased quickly. Unfortunately, the transit system has not been able to cope with that. Prior to UPass, it was already straining capacity – and having difficulty justifying to the region as a whole how that capacity was distributed. Because in places where ridership was low because service was poor – and even pockets of dense development were single use and widely spaced – it was hard to justify levels of taxation equal to those in areas where service was better (I cannot use the word “good”). But that toothpaste is out of the tube now. Cancelling UPass would have much larger consequences than not starting it in the first place. And as long as Translink has funding problems to solve, fare evasion is always going to command more attention than it might reasonably merit on a cost benefit or a cost effectiveness basis. Just look at the figures. Actually on second thought look at the absence of the really important figures: no total revenue, no revenue from UPass, no percentages. Just large numbers waved around without context. It’s all spin, no substance. $15 million sounds a lot – it would make a nice lottery win, for instance. But in the context of the transit budget? Or of Translink’s revenue as a whole? Or in terms of what Translink needs in terms of operating funding over and above fare revenue to meet the needs of a growing region that wants to become more sustainable? Which brings me to Jerry Dobrovolny, the City of Vancouver’s Director of Transportation who is starting a public consultation process for the long-range transportation plan for 2040. The city hopes to shape its latest plan with feedback from the public, who can give suggestions at 11 town hall meetings, 50 stakeholder events and through a city website, talkvancouver.com, between now and July 15. A second phase of the plan will start early next year. Interestingly the link the Sun provides (but not as a working, clickable link like the one above) takes you to two such processes – but we will stick to transportation for now. I will go back to the housing one later, since it raises similar issues of governmental “silos”. Dobrovolny envisions a city of dense, compact communities around transit hubs, with HOV and bus lanes on major arterial routes so it’s “not a hardship but a joy” to get out of the car. It has never been unusual to hear Vancouver planners to talk like that, but to hear it from the engineer is progress indeed. I will pass on the HOV for now and just press for bus lanes. Since the city cannot possibly afford to widen any of its arterial streets and avenues, bus lanes can only be made available by taking road space from cars. (Or, whisper it quietly, those wide, treed boulevards.) Dobrovolny could have been doing this for some time – and indeed has been doing exactly that for bicycle lanes. Again, I suspect that this has more to do with who is the Mayor and what his priorities are. In terms of mode share – especially at the regional scale of movement – I happen to believe that bus lanes would benefit more people than bike lanes, especially in a city that has a tight grid of streets and lots of marked cycle routes off the arterial roadways. But I concede that bike lanes in the city centre were an important political fight to win. To entice more walkers, the city would consider wider sidewalks on busy downtown streets like Granville and Georgia to reduce congestion and pedestrian “traffic jams” and ensure they’re covered with awnings to protect people from the rain. More lighting and way-signing would help pedestrians find their way around town. Public spaces with chairs, benches and tables for major events would draw more walkers and cyclists, he added, while traffic calming on neighbourhood streets and separated cycle lanes would make cycling more comfortable for the 60 per cent of people, like seniors and children, afraid to ride in traffic. And those who can’t give up the car would have the option of car-sharing, pay-as-you-drive insurance and low-carbon vehicles. And those of course are largely outside the City’s jurisdiction, but as we saw at the Car2Go launch they are being supportive. More than “somewhat”. In a regional transit system, giving more to those who already have most is politically difficult. We do not have a regionally run system – indeed I doubt we ever did – but it is hard to see how Christy Clark is going to resolve this one. The carbon tax was another of those “revenue neutral” sales jobs – just like the HST. She seems to be making a dog’s breakfast of both right now. Jerry does a good soft shoe shuffle here. Christy Clark is not about sustainability any more than Gordon Campbell was. I frankly doubt her credibility on the HST business and it may even be her downfall. If she can pull it off, expect a fall general election. But also do not expect vast amount of capital flowing to major transit projects from the carbon tax. That is a small slow trickle – but might be useful to prop up operating funding for transit across the province. It would mean less would be going to tax cuts of course, but she is showing that she is far less dogmatic in that area. Even Kevin Falcon now professes the need to do things differently (though I doubt he would have had he won the leadership). Making Vancouver – City or Metro – better able to cope with a world which is reducing is anthropogenic carbon emissions and adapting to the consequences of those already emitted – ought to be item one on the agenda of all the levels of government involved. Since most of us live in cities and all of us depend on what cities provide. ICBC is a provincially directed corporation that could go for pay-as-you-drive but has not, yet. “Can’t give up the car” is a function of housing and highways – and right now I do not see Canada getting back into public provision of housing (except in very limited special cases) and no sign at the provincial level of abandonment of their disastrous highway expansion projects. The City must do what it can – and I would like to suggest that among those things could be providing a downtown streetcar. 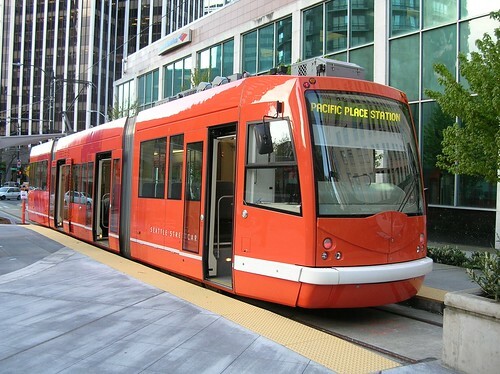 Both Seattle and Portland found ways to do that outside of their regional transit systems. Because it was a City priority, but not a regional priority. And it was more to do with encouraging compact urban development in both of those cities than with current transportation demand. Our needs are a bit different – and we already have the compact development along much of the route. Much of what must be achieved in this region requires senior governments to start to grapple effectively with issues that up to now they have muffed. Or they could (even more unlikely) stop treating municipal government so badly. Taxinequities is a powerpoint slide show that Gaetan Royer, the City Manager of Port Moody has put together. I saw it at the Green Party of BC AGM, and applauded it loudly. Hardie said TransLink has not considered cancelling the U-Pass program over the pass reselling problem. Railway Track and Structures (bet that doesn’t feature on your regular reading list) reports on the progress towards selecting one of three qualified bidders. The province is providing C$40 million for the Smart Card and Faregate project, while the federal government is contributing C$30 million from the Build Canada Fund. TransLink is covering the remaining costs – approximately C$100 million of the estimated C$170 million capital project. Now I may be wrong, and I have spent too long on the other post I just put up to go look, but that does not seem to me to be the same figures I have seen quoted before. Can someone put me straight? Translink has just put out a news release touting the next phase of its combined Smartcard and Faregate program. Jeff Nagel called me about it – wanting a comment – and while I am waiting for him to call me back for a comment, I decided to put my thoughts on it in writing. It will be interesting to se how much of what i say makes it to the paper. First off, Smart cards that passengers can preload are a very good idea. I used the Oyster card when I was in London last year, and was impressed with its ease of use. Though I did not appreciate having to wait in a very long line up at Victoria Station to buy one from the ticket office. I would have thought that this was the sort of transaction that could easily be done by a machine. 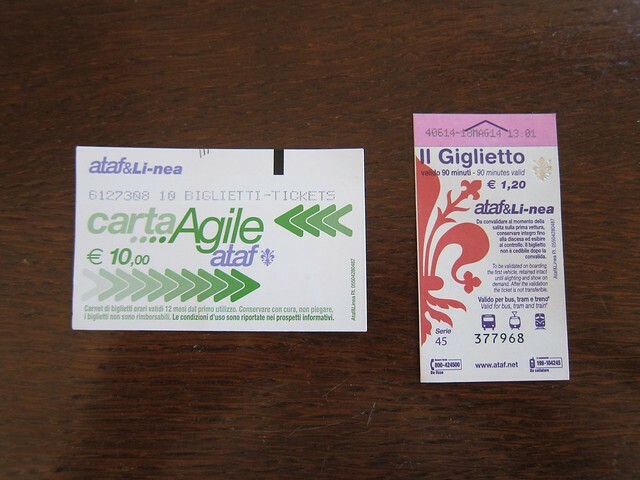 I wanted two cards each loaded with enough value for three days unlimited travel in zone one only. The only real glitch – since recently fixed by a new agreement with the privatised national railway operators – was that it could not be used to take the most direct route back from Greenwich to Waterloo (we had gone out by river bus, and also used the card on that, but it just got us a discount not a ride). Translink say that they are going to leave the present three zone (Monday to Friday until 1800) system in place. But also note that “new technology will have the flexibility to allow for new fare options and a greater variety of price incentives to reward customer loyalty and attract new people to transit”. Well you could do that now with the present system. You would just have to use the present cards’ mag stripe and have more people swipe than the present reliance on cards that are flashed at an operator – who usually pays no attention. Actually fare incentives simply get transit users to make more rides – and do very little to get people out of their cars. People who drive really are unconcerned about fares. So if spending this amount of money is thought to improve mode share – and those words never appear in Translink press releases – think again. But of course mode share increase should be the aim. The claim is made that the cards will provide data – but the current system does that already. The data is largely ignored, simply because no-one has worked out a model to convert the swipes into rides. This is not too hard to develop if you have a good trip diary survey. Sadly Translink has never invested enough in asking basic questions about trip making: the sample we have at 0.4% is an order of magnitude less than that used by Toronto, for example. Besides it has always been the practice at Translink to make up the ridership stats: much more fun and less work. The real sticking point for me is the claim that gates make riders feel safer. They may do that, but riders will in fact be less safe. That is becuase once the gates go in there will much less need to have police patrolling the system and asking to look at tickets. This currently does not find many fare cheats but is valuable because it finds people with outstanding warrants and other offences. That won’t happen once the gates are there. (This issue is covered in earlier posts to this blog that you can find easily).